London to Switzerland . . . Lunch in London, bedtime in Switzerland, by high-speed train! Leave London at lunchtime and reach Switzerland that evening, without setting foot on a plane. Eurostar links London with Paris in 2h20 from £44 one-way or £58 return. Have lunch at the Train Bleu restaurant at the Gare de Lyon, then take a TGV-Lyria high-speed train from Paris to Geneva (3h05), Lausanne (3h39), Bern, Basel (3h03) or Zurich (4h03) from just €29 each way. It's more civilised, comfortable, enjoyable & environmentally-friendly than any flight, centre to centre with no baggage fees or airport taxes. Infants go free & there's great scenery on the way. This page explains the best routes, train times, fares & how to buy tickets. SBB-CFF-FFS (Swiss Federal Railways) & many private operators. 20 April 2019. Train times valid 9 Dec 2018 to 14 Dec 2019. It's easy and affordable to travel from London to Basel or Zurich by train. Take Eurostar from London St Pancras to Paris Gare du Nord in just 2 hours 20 minutes, then a direct TGV-Lyria high-speed train from Paris Gare de Lyon to Basel in 3 hours 03 minutes or Zurich HB in 4 hours 03 minutes. London to Basel or Zurich starts at £62 one-way, £115 return, city centre to city centre, no baggage fees, no check-in fees, no extra to pay to travel to and from airports, a journey for chilling out not stressing out. The TGVs from Paris to Basel & Zurich are run by Lyria, a consortium of the French and Swiss national railways. The Rhine-Rhone high-speed line opened in 2011, cutting another half hour off journey times from Paris to Basel & Zurich. At the same time, Paris-Basel-Zurich TGVs switched to start from the Gare de Lyon instead of the Gare de l'Est, and are now routed via Dijon and Mulhouse instead of Strasbourg and Mulhouse. Alternatively, you can travel from London to Basel or Zurich via Brussels & Cologne. This takes longer, but avoids having to cross Paris and offers fares from just €59.90, see the Switzerland via Brussels section below. If you'd prefer to take a ferry rather than Eurostar, see the route via the Harwich-Hoek overnight ferry. How to read these timetables: It's very simple, you read downwards, each column is a journey you can take. You change trains at each grey bar. * = the 05:40 Eurostar from London to Paris usually doesn't run from late July to late August. ** = The 14:23 from Paris to Basel only runs 1 April to 6 July 2019, change in Basel for Zurich. B = Coming from Zurich you need to change at Basel SBB on this departure except on certain dates when it's direct. C = Coming from Zurich you need to change at Basel SBB on this departure. Changing only takes a few minutes. Shaded = time-effective journey with overnight hotel stop in Paris. Check these times & buy tickets online at www.loco2.com. Paris Gare du Nord dep. Free if not occupying its own seat, £13 each way with own seat (£20 1st class). Holders of InterRail or Eurail global pass pay £28 in 2nd class, £56 1st class. £33 one-way, £66 return, 1st class. Companion £33 each way. £18 each way. Guide dogs free. ...Paris to Switzerland by TGV-Lyria: See the Lyria guide Watch the video! Most Paris-Basel-Zurich TGV-Lyrias, a few Paris-Geneva TGV-Lyrias and all Paris-Lausanne & Paris-Bern TGV-Lyrias are single deck TGV-POS trains like the ones shown here, although a couple of Paris-Basel-Zurich TGV-Lyrias & most Paris-Geneva TGV-Lyrias are double-deck TGV Duplex as shown here. 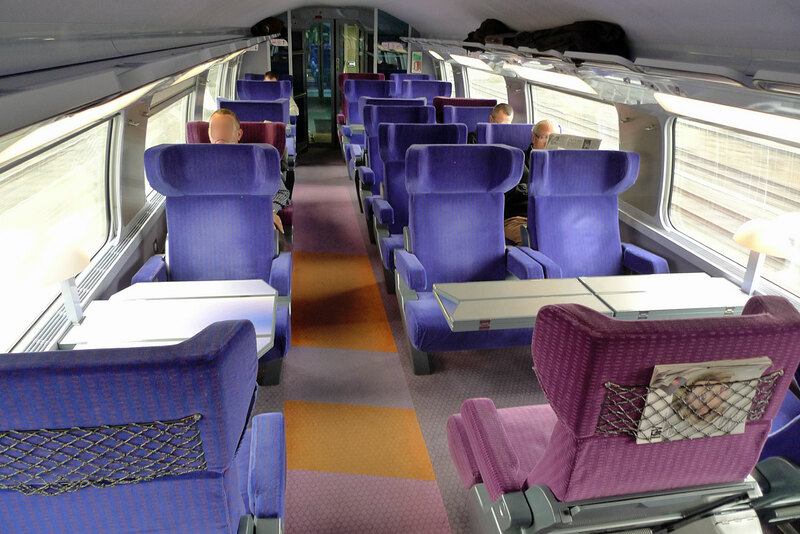 The single-deck TGV-Lyrias feature interiors styled by designer Christian Lacroix. 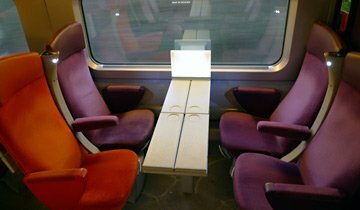 From December 2017 TGV-Lyrias have 3 classes, standard class (2nd), standard premiere (1st class) and business premiere (1st class with hot meal & drinks included in the fare). There's a cafe-bar car selling drinks & snacks. There are power points for mobiles & laptops at all seats in all classes. 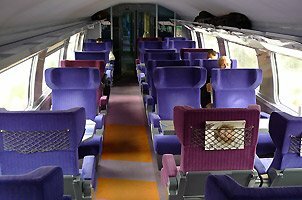 Incidentally, SNCF's in-house designer has never forgiven Christian Lacroix for breaking the unwritten 'rule' and using warm funky oranges and purples in 2nd class, cooler greys and lime green in 1st class, but see what you think! Lyria is a consortium of the French and Swiss national railways, see the TGV-Lyria page for more information. A TGV-Lyria at Paris Gare de Lyon. There's no check-in, you just walk up to it & get on. The cafe-bar, serving tea, coffee, beer, wine, cold snacks & microwaved hot dishes. Larger photo. Standard (2nd) class with mix of unidirectional seats & tables for 4. Seats 2+2 across car width. 360º photo. Standard Premier & Business Premier (1st) class with seats arranged 2+1 across car width. 360º photo. On the route from Paris to Basel & Zurich, the train soon leaves the historic Gare de Lyon behind and accelerates through the Parisian suburbs onto the high-speed line at up to 300km/h (186mph). The train slows down to call at Dijon, the major city of the Burgundy region, with views over the city on the approach. 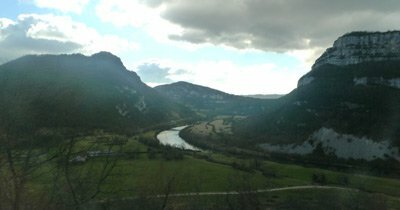 The train continues through the rolling hills of rural France, past pretty villages with picturesque churches onto the new Rhone-Rhine high-speed line where the train reaches 320km/h (199mph). Calling at Mulhouse, the train continues on classic lines to enter Switzerland at Basel. 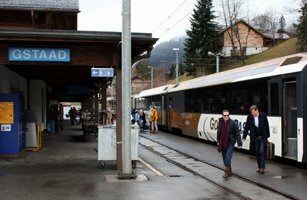 It's easy to buy train tickets from anywhere in Britain to anywhere in Switzerland, here I'll explain the best options. Booking online saves paying phone booking fees, and I recommend www.loco2.com as both Eurostar and TGV-Lyria can be booked in one place with print-at-home tickets and with no added booking fee. You can also book by phone or in person, or get a train travel specialist to arrange a tailor-made trip although this will naturally cost more. 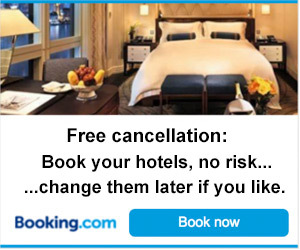 (1) www.booking.com allows you to book your accommodation before train bookings open, at no risk with free cancellation. Click for personal hotel recommendations in Zurich & in the St Moritz area. Use www.loco2.com. You can buy one-way or return tickets in either direction. Who are Loco2? Infants, children & youth fares: On Eurostar & TGV-Lyria, infants under 4 go free with no ticket necessary, children under 12 can travel at the child rate. Youth means anyone under 26.
International credit cards accepted! Anyone from any country can use www.loco2.com, as all credit cards are accepted and you'll usually get a print-at-home or a collect-at-station ticket for Eurostar, TGV-Lyria & any connecting UK train. However, tickets for any onward Swiss domestic trains cannot be printed or collected so will need to be sent by post. Loco2 only sends to UK addresses, so if you live outside the UK simply book from London to your Swiss interchange point (Basel, Zurich, Geneva, Lausanne) at www.loco2.com and book any onward Swiss trains separately at the Swiss Railways website www.sbb.ch, with print-at-home tickets. Booking usually opens 120 days (4 months) ahead for TGV Lyria. Eurostar opens 120 days ahead and at certain periods up to 180 days ahead, but I recommend waiting until your onward TGV-Lyria train opens for booking, so that onward times & prices can be confirmed before you buy a non-refundable Eurostar ticket. Just so you know, the big annual timetable change happens on the 2nd Sunday in December, and most years, bookings for dates after this up to and including the Christmas & New Year period only open around mid-October. On the other hand, in recent years French Railways have opened bookings further ahead than usual over the summer months, so by all means try a booking and see if trains appear. See more information about when European train bookings open. You can book from any station in Britain! www.loco2.com allows you to book to or from any British station (even Little Kimble), not just from London. It usually does this by adding a ticket from your local station to London International CIV (if one is available), which gives you travel to London St Pancras (including the Underground if you need it) and the protection of the CIV international conditions of carriage so if your UK train is delayed and you miss your Eurostar, you are entitled to travel on a later one even if you have a non-changeable ticket. In many cases these fares have fewer or no peak-hour restrictions, too, so they allow Monday-Friday peak-time travel at off-peak prices. More explanation (and the ability to buy a ticket to London International CIV separately if you need to) here. Little Kimble to Geneva? No problem! You can book to most major stations in Switzerland. Loco2 can easily book tickets to Basel, Zurich, Geneva, Lausanne or Bern, and it can also book tickets involving one or two changes of train within Switzerland, for example Interlaken, Lucerne, Grindelwald, Zermatt or St Moritz. However, it doesn't list absolutely every station in Switzerland, and can sometimes struggle if the journey involves more than 3 changes. So if the station you want isn't listed, or if you get an error message, simply book tickets to the nearest big city and buy onward tickets at the station once you get to Switzerland. No advance booking is needed for Swiss internal trains, you just turn up, buy a ticket and hop on. You can check how much Swiss train tickets cost at the Swiss Railways website www.sbb.ch, for English scroll right to the bottom and click 'en'. Money-saving tip: You can sometimes save up to 70% on the Swiss domestic part of the journey (for example, the Basel-Lucerne part of a London or Paris to Lucerne journey) by waiting until 60 days or less before departure and seeing if www.sbb.ch has a Supersaver ticket available for that part of the journey as explained here. But do read what I say about them when buying a ticket to connect out of a train from Paris! Fares vary like air fares, so book as far ahead as you can: Fares for Eurostar & TGV-Lyria trains are cheaper in advance, more expensive closer to the date of travel, so book as early as you can and search for the cheapest departures. Remember that the cheapest tickets mean no refunds, no changes. Once you're in Switzerland, Swiss domestic fares are fixed-price so don't vary according to when you buy them. You can buy them at the station on the day at the same price. 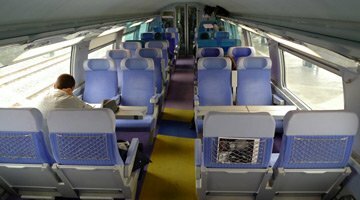 Tip: Choose an upper deck seat on a TGV Duplex: I recommend an upstairs seat for the best views if your TGV-Lyria is a double-decker TGV Duplex. These now operate most Paris-Geneva services & a couple of Paris-Basel-Zurich departures. 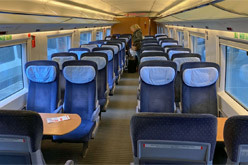 Unlike some sites, www.loco2.com allows you to choose upper or lower deck. 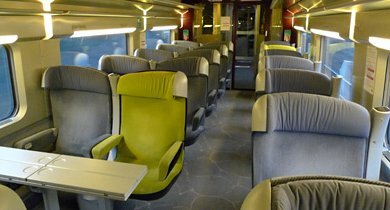 Tip: Upgrade to 1st class on TGV-Lyria, often for little extra cost! 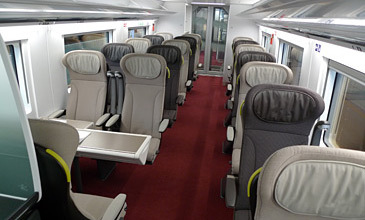 Most booking sites won't let you mix & match 2nd class on Eurostar (on which 1st class is expensive) with 1st class on the onward TGV-Lyria, on which 1st class (called standard première or business première) sometimes costs little more than standard class. With Loco2 there's an easy solution: Before running the enquiry, click '+ Add via/stopover', enter Paris Nord, select 'specific duration' & enter (say) 1 hour. In the search results, instead of showing a total price for London to your Swiss destination, it will allow you to select a class & price from London to Paris and a separate class & price from Paris to Switzerland. See if there's a cheap 1st class fare for the TGV-Lyria! Tip: Don't be afraid to split the booking in Paris! For complete control, first book from your local station to Paris, add to basket, then book from Paris to Switzerland remembering to allow at least 60 minutes to cross Paris trains southbound, 90 minutes including Eurostar check-in northbound. Add to basket and checkout. You can easily adjust the Paris time this way, to stop off in Paris or perhaps have lunch at the Gare de Lyon. SNCF's database now has some sub-standard 40-minute cross-Paris connections when I'd recommend at least 60 minutes, so this is the way to avoid those, too (Loco2 cannot edit these sub-standard connections out, but have thoughtfully added a warning when a sub-60-minute cross-Paris connection comes up). Train seat numbering plans: You can find a Lyria seat numbering plan at www.tgv-lyria.com, and seat plans for other trains here, including Eurostar. On the confirmation page, click 'show itinerary details' to see the seat & coach number you've been given. Who powers Loco2? www.loco2.com connects to French Railways ticketing system (and to the Italian, Spanish, German ticketing systems), if you select EUR prices will be the same as you'll find on French Railways' own site en.oui.sncf.com or on tgv-lyria.com. But it's easier to use. The Man in Seat 61 says: "Loco2 has been started by two young entrepreneurs who are passionate about European train travel, and it shows. They use the trains themselves, and want to make booking them easy. What they have been able to do so far is remarkable. They've added a connection to UK National Rail so you can book through to or from any British station, and they've now added a connection to DB (German Railways), Trenitalia and Renfe with more connections likely to come. This is the site to watch..."
Step 1: Book the TGV from Paris to Switzerland at www.trainline.eu, after signing up for an account. You can usually simply print out your own ticket, or for a few ticket types collect them at the station in Paris. www.trainline.eu will easily book the direct TGVs from Paris to Geneva, Lausanne, Basel, Zurich or Bern, and it will also book tickets to many destinations involving one change of train in Switzerland, such as Interlaken or Brig. But it can struggle with destinations requiring more changes, for example Grindelwald, Zermatt or St Moritz. If you have any difficulty booking to your final Swiss destination, simply book the direct TGV from Paris to Lausanne, Bern, Basel or Zurich. Alternatively, you can book from Paris to anywhere in Switzerland using the Swiss Railways website www.sbb.ch, as long as you're offered the option to self-print tickets when the delivery options come up. This option will appear for cheap train-specific fares, but not for flexible fares. Prices are the same as on oui.sncf. For one-way or return journeys to Paris starting at the Switzerland end, www.sbb.ch is the best site to use, as tickets of all types can be collected at any main Swiss station. 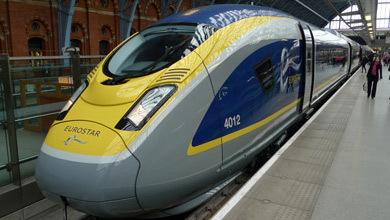 Step 2: Book a connecting Eurostar from London to Paris. Go to www.eurostar.com and book a suitable Eurostar from London to Paris and back. Use the Eurostar times on this page as a guide, but feel free to choose an earlier Eurostar from London or a later Eurostar back from Paris if these have cheaper seats available or if you'd like to stop off in Paris. You can print out your own ticket, or collect it at the station at London St Pancras. Easy! Step 3, buy onward domestic Swiss tickets separately either online at www.sbb.ch or at the station when you get to Switzerland. This is easy, because no advance booking is necessary for Swiss domestic trains, you can turn up, buy a ticket and hop on. Money-saving tip: If you buy at www.sbb.ch less than 60 days before departure but as far ahead within those 60 days as you can, you can sometimes find cheap advance-purchase Supersaver fares which are valid on that specific train only, no changes to travel plans, no refunds, but can save up to 70% off the regular fare. Just read what I say about these Supersaver fares first, especially if connecting off a train arriving from Paris. You can buy from Rail Europe in the United States, Canada, Australia, Asia, Africa or South America: If you live outside Europe you can book with www.raileurope.com (USA), www.raileurope.ca (Canada) or www.raileurope-world.com (Australia, NZ, Asia, Africa, South America). All these sites charge a booking fee, and none give seating options. I'd also recommend a price comparison with the other sites mentioned above, as I have known www.raileurope.com suppress the cheapest fares for the US market, meaning you could make significant savings using www.loco2.com or www.trainline.eu instead. In addition, see this table comparing the features of the various sites selling French train tickets. To buy tickets by phone, call International Rail on 0844 248 248 3, lines open 09:00-17:00 Monday-Friday. Overseas callers call +44 844 2482483. Remember to book early for the cheapest prices, ideally 2-3 months ahead, as just like air fares prices increase closer to departure. International Rail charge a £10 booking fee for bookings under £100, £20 for £100-£300, £30 above £300. Eurostar & TGV-Lyria tickets will usually be emailed to you as e-tickets, so there's no postage fee or delay. Alternatively, try Ffestiniog Travel on 01766 512400, 8% booking fee applies, office hours Monday-Friday. 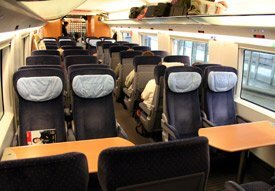 For more information about how to buy European train tickets, see the How to buy train tickets to Europe page. If you want a holiday to Switzerland with travel from the UK by train, call train travel specialist Railbookers. They offer custom-made holidays & tours to Switzerland with trains, transfers & hotels all sorted for you in one place. And as they are selling you a package they'll look after you if anything happens such as a strike or major delay. 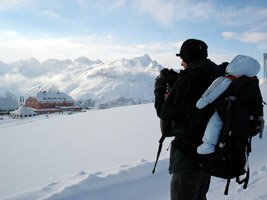 Their two most popular Swiss holidays are Classic Bernina Express & Glacier Express which includes train travel from the UK to Switzerland so no flying necessary, and Switzerland's Lakes & Mountains which they can customise for you with train travel between the UK & Switzerland rather than flights, just call them & ask. If you'd prefer to go to Switzerland on an escorted tour with a convivial group of travellers rather than travelling solo, here are the two UK companies which arrange escorted tours by train from the UK to destinations all over Europe on various dates through the year. 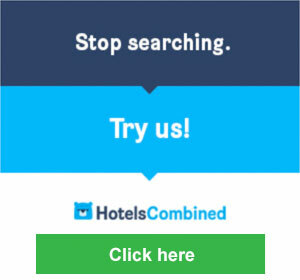 Both companies are part of the same group. Eurostar links London and Paris in just 2 hours 20 minutes from £44 one-way or £58 return. High speed TGV Lyria trains then link Paris with Geneva in just over 3 hours from £21 each way. For the first part of their journey, the Paris-Geneva TGVs use the TGV-Sud Est high speed line at up to 186 mph. Then they slow right down over conventional lines through beautiful French mountain scenery for the remainder of their run to Switzerland, past pretty French villages, mountain forests, dramatic viaducts and scenic lakes, see photos of the journey below. Sit back with a glass of wine and enjoy the scenic stress-free alternative to flying to Geneva. How about taking an earlier Eurostar and having lunch at the amazing Train Bleu restaurant at the Gare de Lyon? Fri = Only runs on Fridays. Free (if not occupying its own seat), £13 with own seat (£20 1st class). Holders of InterRail or Eurail global pass pay £23 in 2nd class, £49 1st class. 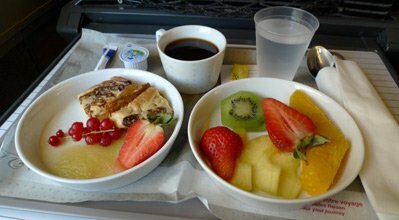 (1) By Eurostar from London to Paris: See the Eurostar page for photos & information on Eurostar, check-in & the journey. These impressive 320 km/h (200 mph) double-deck TGV Duplex trains now operate most Paris-Geneva TGV-Lyria services plus a couple of Paris-Basel-Zurich departures, although a few Paris-Geneva trains are still single-deck Christian Lacroix TGVs. I recommend an upper deck seat for the best views of the scenery. The stairs to the top deck are short, wide and easy, and there are luggage racks and toilets both upstairs and downstairs. You walk through the train to the cafe-bar at the upper deck level. TGV-Lyria euroduplex train to Geneva, at Paris Gare de Lyon. These 200 mph double-deckers operate most Paris-Geneva & some Paris Basel-Zurich trains. Watch TGV Duplex video. 2nd (standard) class on upper deck with a mix or tables for 4 and unidirectional seating. 360º photo. 1st class on upper deck, used as Standard Premiere & Business Premier. 360º photo. A TGV Duplex. The 1 near the door indicates 1st class. You enter on the lower deck, with 9 wide and easy stairs up to top deck. In 2010 they shaved another 15-20 minutes off the Paris-Geneva journey time by rebuilding the amazing 65km single-track Haut-Bugey line from Bourg en Bresse to Bellegarde. This section of line dates from 1877-1882, but local traffic had declined and the line was partially closed in 1990. However, a joint French-Swiss project gave it a new lease of life, rebuilt to mainline standards and reborn as a key link in the TGV network. It shortens the distance between Paris & Geneva by 47km, trains previously had to detour south via Culoz. The wonderful Haut-Bugey line takes Paris-Geneva TGVs at low speed through some great mountainous terrain, some of it inaccessible by road, through some 11 tunnels and over 80 bridges & viaducts including the spectacular Cize-Bolozon viaduct over the Ain gorge, a structure partly blown up by the French resistance in 1944 (it took 5 years to repair the damage after the war). Relax and enjoy the journey! 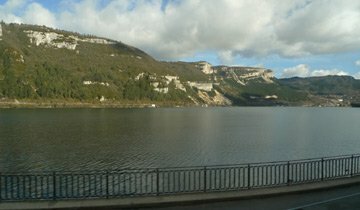 More scenery, as the TGV from Geneva to Paris heads through the hills along the river valley from Geneva to Bellegarde and Bourg en Bresse. 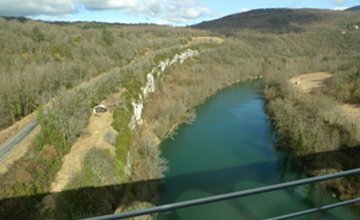 Crossing the spectacular Cize-Bolozon viaduct over the Ain gorge, the major structure on the Haut-Bugey line. At Macon, the train joins the high-speed line to Paris. In business première the fare includes food served at your seat with wine or other drinks. Taking the train is the stress-free and environmentally-sound way to go from London to Bern. Eurostar links London and Paris in just 2 hours 20 minutes from £44 one-way or £58 return. 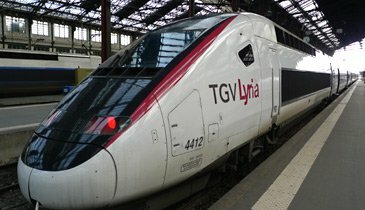 A daily high speed TGV-Lyria train links Paris with Bern in just 4 hours 27 minutes from £21 (€25) each way, with other departures available with a change in Basel. TGV-Lyrias have standard class (2nd class), standard premiere (1st class) and business premiere (1st class with flexible fares and an at-seat meal & wine included in the fare). 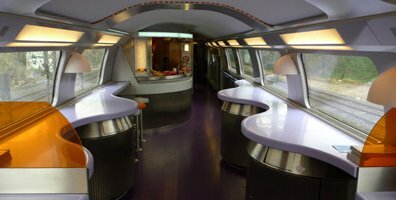 There's a cafe-bar car selling drinks & snacks. There are power points for mobiles & laptops at 1st class seats. 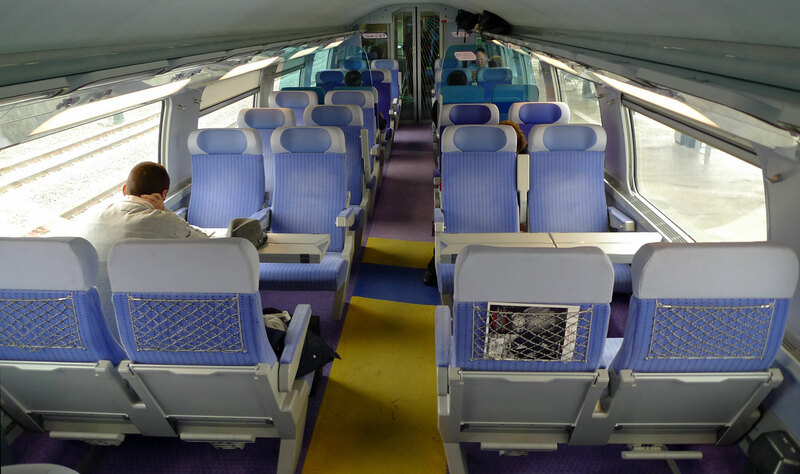 You can find a seat numbering plan & other useful information at www.tgv-lyria.com. Lyria is a consortium of the French and Swiss national railways. What's it like on board a TGV-Lyria?. * = the 05:40 Eurostar from London to Paris doesn't run from late July to late August. Direct = by direct TGV-Lyria from Paris to Bern. This is the recommended option if it suits your plans, as it's cheapest & simplest. Eurostar times can vary slightly so always double-check when booking. Check these times & buy tickets online at www.loco2.com. Free if not occupying its own seat, £13 with own seat (£20 in 1st class). Holders of InterRail or Eurail global pass pay £28 in 2nd class, £56 in 1st class. Fares for journeys with a change in Basel: See the London-Paris-Basel fares in the London to Basel section, and add the cost of a Swiss domestic ticket from Basel to Bern, CHF 40 (£30) each way 2nd class. It works out cheaper to use the direct Paris-Bern train if you can! To buy tickets online, by phone or in person, follow the instructions above. For journeys involving a change in Lausanne, if no cheap fares show up for the Paris-Bern journey, trying asking the system for Paris-Lausanne, then buy a Lausanne-Bern ticket separately at the ticket office on arrival at Lausanne. You can check Lausanne-Bern prices online at www.sbb.ch. No reservation is necessary (or even possible!) for the domestic Swiss Lausanne-Bern section, so it's easy to buy this at the station in Lausanne. Taking the train is a wonderful, stress-free and environmentally-friendly way to get from London to Lausanne or anywhere in Western Switzerland. Take Eurostar from London to Paris in just 2 hours 20 minutes from £44, then a high-speed TGV-Lyria train from Paris to Lausanne in only 3 hours 40 minutes, from £21 each way. Remember that's city centre to city centre, no added baggage fees, no extra to pay to get to and from airports, and infants under 4 go free. The TGV-Lyria travels at up to 186mph along the TGV-Sud-Est high-speed line, then branches off at lower speed through pretty hills around Dijon and across rural France into Switzerland. Frequent Swiss trains, running like clockwork, link Lausanne with Vevey, Montreux, Aigle, Martigny, & Sion. Change at Montreux for the scenic Golden Pass route to Gstaad. Take a bottle of wine onto the TGV with you, put your feet up and enjoy the ride. 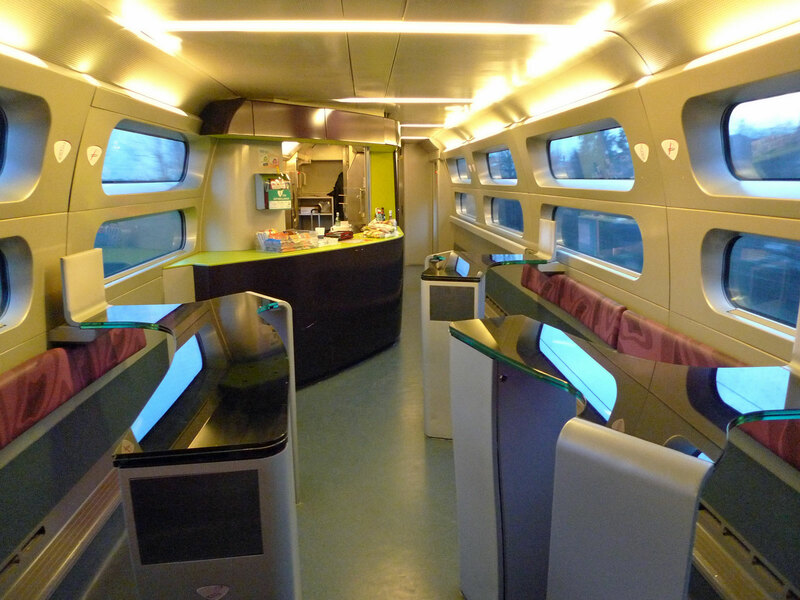 On TGV-Lyria, business première fares include a complimentary meal and wine served at your seat. What's it like on a TGV-Lyria train?. Pictured right: Taking the train from London to Gstaad. It's a very scenic train ride from Montreux to Gstaad, and some departures use panoramic coaches like these. How to read these timetables It's simple, you read downwards, each column is a journey option you can take. You change trains at each grey bar. Why not book an earlier Eurostar and give yourself time for lunch in Paris at the celebrated Train Bleu restaurant inside the Gare de Lyon? Times may vary so always check exact times online. Check these times & buy tickets at www.loco2.com. Lausanne is the ideal entry point for western Switzerland. Frequent (at least half-hourly) trains link Lausanne with Vevey, Montreux (19 minutes), Sion, & Martigny. Change at Montreux for the amazingly scenic narrow-gauge Golden Pass route to Gstaad & Zweisimmen. The Golden Pass route from Montreux to Gstaad climbs spectacularly up the mountain out of Montreux, passing over the top to the valley behind. You can check train times and fares from Lausanne to anywhere in Switzerland at www.sbb.ch. Free if not occupying its own seat, £13 with own seat (£20 1st class). Holders of InterRail, Eurail, etc. pay £13 in 2nd class, £46 in 1st class. Lausanne to Montreux is CHF 6.30 (£5) each way 2nd class. Lausanne to Gstaad is CHF 33 (£25) each way 2nd class, CHF 58 (£44) 1st class. You can check fares for any journey in Switzerland at www.sbb.ch. The best way to buy onward tickets from Lausanne to Montreux or Gstaad is at the station when you reach Lausanne or at www.sbb.ch. It's so easy to travel by train from the UK to Interlaken and the Jungfrau region. Take Eurostar to Paris in only 2 hours 20 minutes from £44, then a 186 mph TGV-Lyria from Paris to Basel in just 3 hours from £21. Regular Swiss InterCity trains go from Basel through the mountain and along the lake shore to Interlaken Ost in 1 hour 58 minutes. No airports, no flights, a chance to chill out by train not stress out by plane. TGV-Lyria trains have 3 classes, standard class (2nd class), standard première (1st class) & business première (1st class with a meal & wine served at your seat included in the fare). 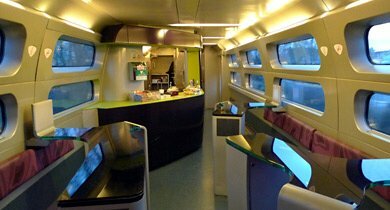 There's a cafe-bar car selling drinks & snacks, and you'll find power points for mobiles & laptops at all 1st class seats. Take a bottle of wine with you, put your feet up and enjoy the ride! TGV-Lyria is a consortium of the French and Swiss national railways. Interlaken lies at the centre of the Jungfrau region, with narrow gauge local trains up into the mountains to skiing resorts such as Grindelwald nestling at the foot of the Eiger, and Lauterbrunnen, at the foot of the Jungfrau. 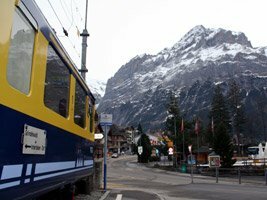 The famous Jungfraubahn rack railway climbs the Jungfrau to the Top of Europe from both Grindelwald and Lauterbrunnen. Pictured right: Just arrived from London by train... The local train to Grindelwald has reached the buffer stops at the end of the line from London St Pancras, no flying necessary. ** = 05:40 Eurostar to Paris doesn't run from late July to late August. Lauterbrunnen & Wengen:: Half-hourly local trains link Interlaken Ost with Lauterbrunnen, journey time 20 minutes. Change at Lauterbrunnen for Wengen, total journey time from Interlaken to Wengen is 46 minutes. You can check times and fares using the journey planner at www.sbb.ch. By train up the Jungfrau. Train times may vary so always double-check for your date of travel. Check these times & buy tickets online at www.loco2.com. Basel to Interlaken is CHF 60 (£45) each way in 2nd class. Basel to Grindelwald CHF 71 (£54) each way in 2nd class. The best way to buy onward tickets from Basel is either at the station when you reach Switzerland or online at the Swiss Railways website www.sbb.ch. No reservation is necessary for Swiss domestic trains, you just buy a ticket and hop on. 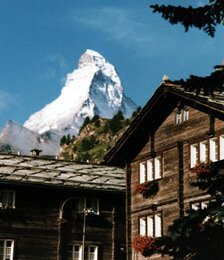 Zermatt lies nestled at the foot of the imposing Matterhorn, surrounded by mountains. It's a car-free resort, which can only be reached by train. Electric 'johnny cabs' shuttle hotel guests to hotels and act as taxis. Here is the daily all-year-round train service. To reach Zermatt, simply hop on a Eurostar to Paris in 2h20 then take a TGV-Lyria high-speed train from Paris to Lausanne in just 3h40. Hourly Swiss trains link Lausanne with Visp, where you board the little narrow-gauge branch line up the Mattertal Valley to Zermatt. The branch line from Brig or Visp to Zermatt: For the best views of the scenery between Visp and Zermatt, make sure you have a seat on the left-hand side of the train leaving Visp. This narrow gauge train ascends the Mattertal Valley via a series of 'steps'. The train uses conventional adhesion along the level sections, then rack-and-pinion to climb a series of steep sections. Train times can vary so always check times for your date of travel online. Check these times & buy tickets at www.loco2.com. 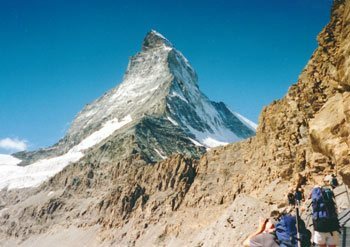 Lausanne to Zermatt costs CHF 80 (£60) one-way, CHF 160 (£120) return. You can check Swiss rail fares at www.sbb.ch. If you want a compete custom-made trip with all your rail travel expertly booked for you and good quality hotels arranged, call Railbookers. Just tell them what you want, and they'll advise you on the best trains, routes & hotels and sort it all out for you, hassle-free. They get very positive reviews and take good care of their guests. To reach the hotel, simply use www.sbb.ch to search from Zurich or any station in Switzerland to a destination listed as 'Muottas Muragl'. This will give you precise combined train+funicular times & prices. The area around St Moritz, Davos and Klosters has attracted visitors from the UK both for winter sports and summer holidays for over a century. The journey by narrow-gauge train from Chur to St Moritz is one of the most scenic train rides in Switzerland, or indeed the world. 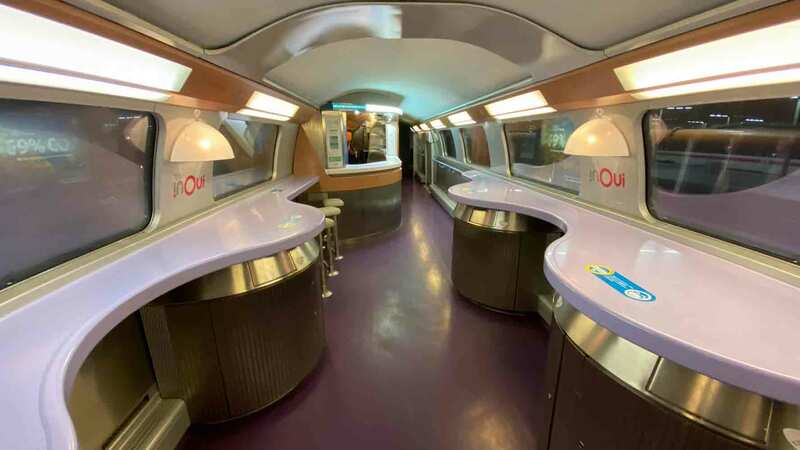 The convenient direct sleeper train from Paris to Landquart & Chur was withdrawn with the opening of the TGV-Est high-speed line in June 2007, so here's how to get there overland using the new high-speed TGV trains. Travel from London to Paris by Eurostar, leaving London St Pancras daily at 07:55 Mondays-Saturdays, arriving at Paris Gare du Nord at 11:17. By all means use the 07:01 Eurostar Monday-Friday or 06:18 Eurostar on Saturdays if you'd like more time to cross Paris. Cross Paris by metro to the Gare de Lyon, it's just 2 stops on RER line D.
Travel from Paris to Zurich by 198 mph TGV-Lyria, leaving Paris Gare de Lyon at 12:23 and arriving in Zurich HB at 16:26. A cafe-bar is available. For St Moritz, leave Zurich HB at 17:37 by InterCity train, changing at Chur onto the narrow-gauge Rhätische Bahn, arriving St Moritz at 20:58. For Klosters or Davos, leave Zurich HB at 17:37 by InterCity train, change onto the narrow-gauge Rhätische Bahn at Landquart, arriving Klosters Platz at 19:26 and Davos Platz at 19:56. You can of course use any of the London-Zurich options shown in the London to Zurich section above, then use www.sbb.ch to find connections to St Moritz. Travel from London to Paris by Eurostar, leaving London St Pancras daily at 09:22, arriving at Paris Gare du Nord at 12:56. Tip: I recommend taking the earlier 07:55 or 08:31 Eurostar and having lunch at the celebrated Train Bleu restaurant at the Gare de Lyon, which also gives you more time in hand to cross Paris. Cross Paris by metro to the Gare de Lyon, it's just 2 stops on RER line D or 25 minutes by taxi. Travel from Paris to Basel by 198 mph TGV-Lyria, leaving Paris Gare de Lyon at 14:23 and arriving in Basel SBB at 17:26. A cafe-bar is available. At Basel SBB, have a coffee or beer in the station's historic cafe-bar. For St Moritz, leave Basel SBB at 18:33 by InterCity train, changing at Chur onto the narrow-gauge Rhätische Bahn, arriving St Moritz at 22:58. For Klosters or Davos, leave Basel SBB at 18:33 by InterCity train, change onto the narrow-gauge Rhätische Bahn at Landquart, arriving Klosters Platz at 21:29 and Davos Platz at 21:57. Coming from St Moritz, travel from St Moritz to Zurich by train, leaving St Moritz at 09:02 by narrow gauge Rhätische Bahn train, with a simple change at Chur onto the standard gauge Swiss Federal Railways InterCity train to Zurich, arriving Zurich HB at 12:23. Coming from Davos or Klosters, leave Davos Platz at 10:02 or Klosters Platz at 10:31, changing from the narrow gauge Rhätische Bahn to the Swiss Federal Railways InterCity train at Landquart, arriving Zurich HB at 12:23. Travel from Zurich to Paris by 200 mph Lyria TGV, leaving Zurich HB at 13:34 and arriving Paris Gare de Lyon at 17:37. A cafe-bar is available. Cross Paris by metro to the Gare du Nord. Travel from Paris to London by Eurostar, departing Paris Gare du Nord at 19:13 arriving London St Pancras at 20:39. Coming from St Moritz, travel from St Moritz to Zurich by train, leaving St Moritz at 11:02 by narrow gauge Rhätische Bahn train, with a simple change at Chur onto the standard gauge Swiss Federal Railways InterCity train to Zurich, arriving Zurich HB at 14:23. Coming from Davos or Klosters, leave Davos Platz at 12:02 or Klosters Platz at 12:31, changing from the narrow gauge Rhätische Bahn to the Swiss Federal Railways InterCity train at Landquart, arriving Zurich HB 14:23. Travel from Zurich to Paris by 200 mph Lyria TGV, leaving Zurich HB at 15:34 and arriving Paris Gare de Lyon at 19:37. A cafe-bar is available. Cross Paris by metro to the Gare du Nord. Travel from Paris to London by Eurostar, departing Paris Gare du Nord at 21:13 daily except Saturdays arriving London St Pancras at 22:39. 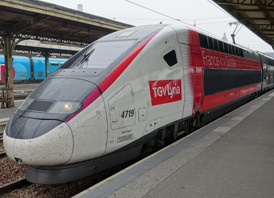 Paris to Zurich by Lyria TGV starts at £26 each way in 2nd class, £68 each way in 1st class, but as you'll see in a minute, you only need to book a ticket from Paris to Basel. See the London to Basel & Zurich section for full details of London-Basel & London-Zurich fares. Zurich to St Moritz costs CHF 75 (£57) one-way, CHF 150 (£114) return in 2nd class, the Swiss Railways website www.sbb.ch will confirm current fares. Buy your tickets as shown above. If you need hotels booked for you as well, the easy option is to get specialist agency Railbookers to arrange your whole trip, with train bookings, hotels & transfers all sorted in one phone call. Tell them when and where you want to go and they'll advise you on the best trains, routes & hotels and sort it all out for you. They get very positive reviews. 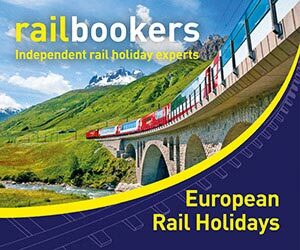 UK residents call www.railbookers.co.uk on 020 3327 0761. US residents call toll-free on 1-888-829-4775 or see website. Canadian residents call toll-free on 1-855-882-2910 or see website. Australian residents call toll-free on 1300 971 526 or see see website. New Zealand residents call toll-free on 0800 000 554 or see website. Vaduz (the capital of Leichtenstein) has no rail station, but buses link it with Buchs & Sargans stations in Switzerland every 30 minutes, and with Feldkirch station in Austria every hour. You can check bus times for all these services at www.lba.li. For travel between anywhere in Switzerland & Vaduz, catch a train to Sargans, then the bus to Vaduz-Post. You can check times & fares at www.sbb.ch. For travel between anywhere in Austria & Vaduz, catch a train to Feldkirch, then the bus to Vaduz-Post. You can check times & fares at www.oebb.at. The main Zurich-Innsbruck railway cuts through Liechtenstein but the expresses don't stop at any of the four local stations within the principality. Schaan-Vaduz is probably the most important of these stations, but it's served only by somewhat irregular Buchs-Feldkirch local trains. You can check train times at www.sbb.ch but will need to look carefully for trains rather than buses - look for departures marked R or RE, not BUS. Schaan-Vaduz Bahnhof is just 11 minutes by frequent bus from Vaduz itself. Step 1, travel from London to Zurich by Eurostar & TGV-Lyria as shown above. Step 2, take a regular Swiss domestic train from Zurich to Sargans, these run twice an hour, journey time 55-67 minutes, check times & prices at www.sbb.ch. No reservation necessary, just turn up, buy a ticket and hop on the next train. Step 3, catch a bus from outside the station to Vaduz Post Office, every 30 minutes, journey time 32 minutes, check times at www.lba.li. No reservation necessary, buy a ticket from the driver, fare around CHF 7, children under 16 half price. Going via Brussels takes significantly longer than going via Paris as shown above, but it has two key advantages. First, it avoids having to change trains and stations in Paris by metro or taxi. The changes of train at Brussels Midi & Cologne Hbf are straightforward same-station changes taking only take a couple of minutes getting off one train and onto another. This may be important to you if you have lots of luggage, kids, or a mobility issue. Potentially the cheapest way to Switzerland, London to Basel from €69.90! Secondly, if you book well in advance it's possible to find cheap fares from London to Basel Bad Bahnhof from just €69.90, making this route the cheapest way to Switzerland, if you're lucky enough to find the cheapest €69.90 price available (if not, the Paris route may be cheaper). That's because German Railways (DB) offer Sparpreis London fares from London to anywhere in Germany starting from €69.90 each way 2nd class, €129 1st class, and you can buy these to Basel Bad Bahnhof (but NOT to Basel's main SBB station) because DB considers Basel Bad Bf as part of its own German network even though it's across the border in Switzerland, just one stop before Basel SBB. You simply print out your own ticket. You can then buy a separate onward ticket from Basel Bad Bf to Basel SBB or to Zurich and most other Swiss cities. Option 1, London depart 06:47 Monday-Fridays or 06:57 Saturdays (06:13 on Mondays & Fridays April-September), arriving Basel Bad Bahnhof 16:34, Basel SBB 16:47: Leave London St Pancras by Eurostar at 06:47 on Mondays-Fridays (06:13 on Mondays & Fridays from April to September) or 06:57 on Saturdays arriving Brussels Midi 10:05 (09:28 on Mon & Fri July-Sept), a quick change onto the 10:25 high-speed ICE from Brussels to Cologne, change at Cologne Hbf onto another high-speed ICE to Basel Bad Bahnhof arriving 16:34 and Basel SBB 16:47. Click this special link to www.bahn.de and enter your date of travel to buy tickets from London to Basel Bad Bf on this service. To buy an onward ticket from Basel Bad Bf to Basel SBB on the same train for just over €4, click here. To buy an onward ticket from Basel Bad Bf to Zurich, click here. Option 2: London depart 08:55 arriving Basel Bad Bahnhof 18:34 or Basel SBB 18:47: Leave London St Pancras by Eurostar at 08:55 arriving Brussels Midi at 12:05, a quick change onto the 12:25 high-speed ICE from Brussels to Cologne, change at Cologne Hbf onto another high-speed ICE to Basel Bad Bahnhof arriving 20:34 and Basel SBB 20:47. The 12:25 ICE from Brussels to Cologne runs on Fridays & Sundays until 6 April 2019, then every day from 7 April onwards. Click this special link to www.bahn.de and enter your date of travel to buy tickets from London to Basel Bad Bf on this service. To buy an onward ticket from Basel Bad Bf to Basel SBB on the same train for around €4, click here. To buy an onward ticket from Basel Bad Bf to Zurich, click here. Option 3: London depart 10:58 every day, arriving Basel Bad Bahnhof 20:34 or Basel SBB 20:47: Leave London St Pancras by Eurostar at 10:58 arriving Brussels Midi at 14:05, a quick change onto the 14:25 high-speed ICE from Brussels to Cologne, change at Cologne Hbf onto another high-speed ICE to Basel Bad Bahnhof arriving 20:34 and Basel SBB 20:47. 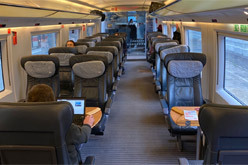 Click this special link to www.bahn.de and enter your date of travel to buy tickets from London to Basel Bad Bf on this service To buy an onward ticket from Basel Bad Bf to Basel SBB on the same train for around €4, click here. To buy an onward ticket from Basel Bad Bf to Zurich, click here. Option 4: London depart 15:04 every day, arriving Basel Bad Bahnhof 00:52: Leave London St Pancras by Eurostar at 15:04 arriving Brussels at 18:05, a quick change onto the 18:25 high-speed ICE from Brussels to Frankfurt, change at Frankfurt onto another high-speed ICE to Basel Bad Bahnhof arriving 00:52 or Basel SBB 01:02. Click this special link to www.bahn.de and enter your date of travel to buy tickets from London to Basel Bad Bf on this service. To buy an onward ticket from Basel Bad Bf to Basel SBB on the same train for around €4, click here. Option 1, departing Basel SBB at 07:06 or Basel Bad Bf at 07:15 daily arriving London at 16:05: Leave Basel SBB at 07:06 or Basel Bad Bf at 07:15 by high-speed ICE train to Cologne, change at Cologne onto another high-speed ICE train to Brussels, change at Brussels onto the 14:56 (14:52 at weekends) Eurostar to London St Pancras, arriving 16:05. Click this special link to www.bahn.de and enter your date of travel to buy tickets from Basel Bad Bf to London on this service. To buy a connecting ticket from Zurich to Basel Bad Bf, click here. To buy a connecting ticket from Basel SBB to Basel Bad Bf on the same train, click here. Option 2, departing Basel SBB at 11:06 or Basel Bad Bf at 11:15 daily arriving London at 19:57 (21:33 on Saturdays): Leave Basel SBB at 11:06 or Basel Bad Bf at 11:15 by high-speed ICE train to Cologne, change at Cologne Hbf onto another high-speed ICE train to Brussels, change at Brussels onto Eurostar to London St Pancras, arriving 19:57 on Mondays-Fridays & Sundays or 21:33 on Saturdays (also on Mon & Tues from 1 November onwards). Option 3, departing Basel SBB at 13:13 or Basel Bad Bf at 13:23 daily except Saturdays arriving London at 21:33: Leave Basel SBB at 13:13 or Basel Bad Bf at 13:23 by high-speed ICE train daily except Saturdays to Cologne, change at Cologne Hbf onto another high-speed ICE train to Brussels, change at Brussels onto Eurostar to London St Pancras, arriving 21:33. About these Sparpreis London fares: Sparpreis London fares vary in price from €69.90 upwards, and booking usually opens 92 days in advance. You'll only find these Sparpreis London fares on journeys via DB's ICE trains between Brussels and Cologne, as opposed to Thalys trains, and you really need to look 2-3 months ahead to see the cheapest price level. You simply print out your own ticket. 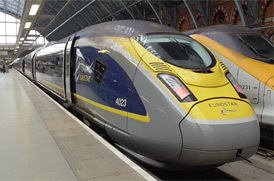 If you cannot find any cheap tickets this way (or need to travel at short notice in the next few days), split the journey, booking London-Brussels at www.eurostar.com then booking Brussels-Basel Bad Bf at www.bahn.de. Or look at some of the other option to Switzerland shown on this page. Onward tickets from Basel Bad Bf to Basel SBB, Zurich, Bern, and so on: Once you have bought a Sparpreis London ticket from London to Basel Bad Bf you can use www.bahn.de again to buy an onward ticket on the same train from Basel Bad Bf to Basel SBB (for just over €4) or indeed onwards to Zurich and other destinations in Switzerland. No need to get off at Basel Bad Bf, if you've bought the onward ticket just stay on until Basel SBB station. An ICE at Brussels, change in Cologne for Switzerland. More ICE info. Travel tip 1: Take the couloir sud short cut when changing trains from Eurostar onto an ICE at Brussels. Diving down the Couloir Sud escalator half way along the Eurostar platform makes changing trains much quicker than slowly following the crowds off the front end of the Eurostar platforms and going the long way round to the main concourse. Travel tip 2, take the scenic Rhine Valley. These days, the system normally routes you via the modern Cologne-Frankfurt high-speed line. However, if you don't mind taking an extra hour or two, simply click 'Add another stopover' and enter 'Koblenz' in a 'Via' box. You'll now be routed via the original, slower Rhine Valley line, snaking along the River Rhine past castles, vineyards and the famous Lorelei Rock. Travel tip 3: If you want to stop overnight (or longer, up to 48 hours) in Brussels or Cologne, simply click Add intermediate stops, type Brussels or Cologne in the via box and the number of hours stopover you'd like (up to 48:00 maximum) in the hh:mm box, then run the enquiry. You can then find the cheap Sparpreis London fares from €59, but with a stopover included. Bargain! Travel tip 4: In the outward direction, the connections in Brussels are a bit tight, although they are officially recognised. If you DO miss a connection at any stage in the journey because of a late-running train, don't panic, simply get your ticket endorsed by the station staff. Because you're travelling with a 'through ticket' you're entitled to travel onwards forward on the next available later train at no extra charge. Cosy cabins: The overnight Harwich-Hoek ferry is a floating hotel. All passengers travel in a cosy private cabin with shower, toilet & satellite TV. This is a Captain's Class cabin. Onwards to Switzerland by ICE high-speed train: This is a superb 175 mph German ICE train at Frankfurt am Main Hauptbahnhof. If you want to avoid the Channel Tunnel, for example if you suffer from claustrophobia or if problems are affecting the Eurostar service, you can travel by train & ferry instead, as shown here. It's one of the routes shown in dark blue on the route map above. This route is also handy if you live in East Anglia as you can travel direct to Harwich avoiding London, and it also avoids France, if the French are on strike again. 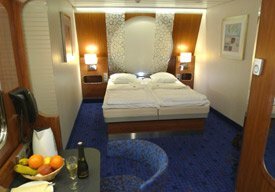 Indeed, you may simply like the idea of cruising overnight in a luxury en suite cabin on the Stena Line superferry, then travelling on by daytime train to Switzerland next morning - see the video! If you need to travel at very short notice when cheap Eurostar tickets have all sold out, this rail & sail option is usually still affordable. Day 1: Travel by train from London to Hoek van Holland by Dutch Flyer train & luxury ferry. You leave London's Liverpool Street station daily at 19:32 on a train to Harwich International. 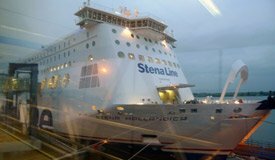 arriving at Harwich around 21:00, the station is right next to the ferry terminal and you walk off the train into the terminal, check in at the Stena Line desk and walk straight onto Stena Line's luxurious overnight superferry Stena Hollandica to Hoek van Holland. The ferry sails at 23:00 and arrives at Hoek van Holland at 08:00 Dutch time next morning. You get on board the ferry around 9pm, have a late dinner in the restaurant and settle into your cabin. All passengers travel in cosy private cabins with en suite toilet & shower & satellite TV. 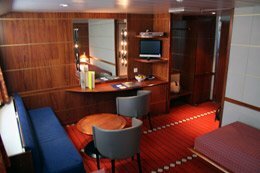 Deluxe Comfort class or Captains class cabins are also available, and there's free WiFi in the lounges, restaurants & bars on 9 deck. The Dutch Flyer is a fully-integrated train & ferry service with special fares from London to Any Dutch Station which cover the train to Harwich, the ferry and onward train to anywhere in the Netherlands, see the Netherlands page for full details. The same special fare from London is valid from any Abellio Greater Anglia station, for example Cambridge, Norwich, Ipswich, Romford or Ilford. Day 2: Arriving at Hoek van Holland in the morning of on day 2, the station is right outside the ferry terminal. Take the temporary rail replacement bus running every 20 minutes (until some time in 2018) or frequent metro train (from some time in 2018 onwards) to Schiedam Centrum and change onto the next available Dutch domestic InterCity train to Rotterdam Centraal and then onto Utrecht. Your Dutch Flyer ticket from London to Any Dutch station covers this section, no reservation is necessary, just hop on any train. 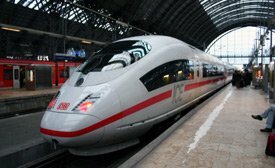 Then take the 11:04 high-speed ICE train from Utrecht to Frankfurt, arriving Frankfurt-am-Main at 14:30. Change onto the 14:50 high-speed ICE train to Basel SBB (arrive 17:47), Bern (arrive 18:56) or Interlaken (arrive 19:57). Change in Basel or Bern for destinations all over Switzerland, you can find train times and prices within Switzerland at www.sbb.ch. Day 1: Take daytime trains from Switzerland to Hoek van Holland. Leave Interlaken at 08:00, Bern at 09:04 or Basel SBB at 10:13, by high-speed ICE train to Frankfurt-am-Main arriving at 13:08. 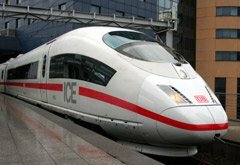 Change in Frankfurt onto the 13:29 high-speed ICE train to Utrecht, arriving 17:00. Now take Dutch domestic trains from Utrecht to Rotterdam and on to Schiedam Centrum for the temporary rail replacement bus (until some time in 2018) or frequent metro train (from some time in 2018 onwards) to Hoek van Holland Haven. This section is covered by your Dutch Flyer ticket from Any Dutch Station to London. At Hoek, the ferry terminal is right next to the station. In suggesting this service from Switzerland I've allowed plenty of time to connect with the overnight ferry, so you could stop off in Utrecht or Rotterdam for dinner. Just make sure you reach Hoek before 21:00, ferry check-in closes 45 minutes before sailing time. Important update: Buses are replacing trains between Schiedam Centrum & Hoek van Holland from 1 April 2017 while the line is converted to light rail. New frequent metro trains will start running from some time in 2019. More details here. Travel overnight from Hoek van Holland to London by Dutch Flyer train & luxury ferry. Check in at the Stena Line desk, then walk onto the luxurious superferry Stena Britannica and sail overnight to Harwich in a snug private cabin with shower, toilet & satellite TV. The ferry sails from Hoek at 22:00 and arrives at Harwich International at 06:30 next morning (day 2), UK time. Take a train on to London arriving 08:45-08:59 (day 2). See the Netherlands page for full details about the Dutch Flyer train & ferry service. London to Any Dutch Station starts at £55 per person each way, plus the cost of a cabin. Cabins start at £34 for a single berth cabin or £45 per cabin for a 2-berth, and are compulsory on the night sailing. The fare covers the train from London to Harwich, the ferry, and onward Dutch trains from Hoek van Holland Haven to any station in the Netherlands, see the Netherlands page for full details of fares and cabin types and costs. Utrecht to stations in Switzerland starts at €59.90 each way in 2nd class or €74.90 in 1st class. Step 1, buy a Dutch Flyer train & ferry ticket from London to Any Dutch Station at the Stena Line website as shown on the London-Netherlands page. Step 2, book your trains from Utrecht to Switzerland at the German Railways website www.bahn.de. You can book to any destination station you like in Switzerland. Booking opens 92 days ahead, sometimes more. You simply print your own ticket. If you prefer you can book by phone, call DB's UK telesales line on 08718 80 80 66, lines open 09:00-20:00 Monday-Friday, 09:00-13:00 at weekends. 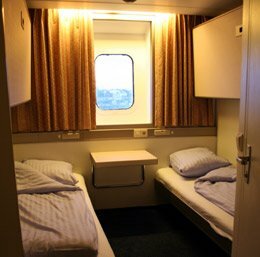 A standard Seaways class cabin with shower & toilet on DFDS Princess of Norway from Newcastle to Amsterdam. 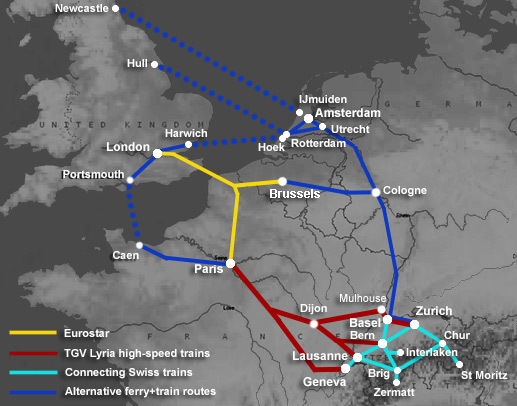 If you live in the North of England or Scotland, option 1 is to take a train up to London and travel from London to Switzerland as described above. This may well be the quickest & easiest option. Here's some advice on buying connecting train tickets to London. If you live in Scotland, the Caledonian Sleepers will get you up to London in time for a morning Eurostar & afternoon TGV to Switzerland. But consider option 2, by-passing London by taking a luxurious overnight cruise ferry from Newcastle to Amsterdam run by DFDS Seaways or a similar overnight ferry from Hull to Rotterdam run by P&O Ferries, then taking a fast comfortable train to Switzerland. Sail overnight by luxurious cruise ferry to Holland, with bars, restaurants & comfortable comfy cabins all with private toilet & shower, arriving next morning. DFDS sail from Newcastle to IJmuiden (near Amsterdam), P&O sail from Hull to Rotterdam Europoort. For details of ferry timetables, station-port transfers, fares & how to buy tickets for travel via each of these ferry routes, see the UK-Netherlands page. Day 2, travel by fast comfortable train from Rotterdam Centraal or Amsterdam Centraal to anywhere you like in Switzerland. You can easily check train times & prices at the German Railways website www.bahn.de - just make sure you allow plenty of time, both to cover any likely delay to the ferry and for the bus transfers from ferry terminal to station. I suggest booking trains leaving around midday. Day 1, take a Swiss train from anywhere in Switzerland to Rotterdam Centraal (for P&O to Hull) or to Amsterdam Centraal (for DFDS to Newcastle), you can check times & prices at the German Railways website www.bahn.de. Just remember to allow plenty of time, meaning hours not minutes, for any likely delay to the train, for the bus transfer to the ferry terminal, and for the ferry check-in. 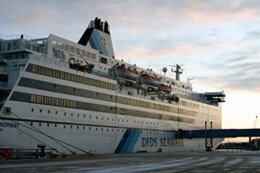 Day 1 evening, sail overnight by luxurious cruise ferry from Rotterdam Europoort to Hull with P&O or from IJmuiden to Newcastle with DFDS, whichever UK port is most convenient for where you live, arriving next morning (day 2). Transfer to the station and take a train home. To check ferry fares & book the ferry online, go to www.dfds.co.uk (Newcastle-Amsterdam), www.poferries.com (Hull-Rotterdam). To check train times & prices and to buy tickets from Rotterdam or Amsterdam to any station in Switzerland, use the German Railways website www.bahn.de. You print your own ticket. Definitely take a good guidebook. For the independent traveller, I think this means either the Lonely Planet or the Rough Guide. Both guidebooks provide the same excellent level of practical information and historical background. You won't regret buying one! In Zurich, for something special, look no further than the superb Hotel Schweizerhof, located right next to Zurich station. One of my favourite hotels, they'll even send a uniformed commissionaire to meet you at the station and carry your bags across the road. 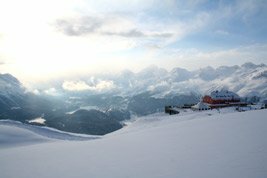 In the St Moritz-Pontresina area, try the Romantik Hotel Muottas Muragl, an amazing place to stay perched on the top of a mountain, with clean simple and (for Switzerland) inexpensive rooms. It's reached via the Muottas Muragl funicular railway from Punt Muragl station, between Pontresina & St Moritz. Hotels near the Gare du Nord with good reviews: Libertel Gare du Nord Suede (5 min walk from Gare du Nord, 2-star, doubles €135), Mercure Terminus Nord (3-star, doubles €180, directly across the road from the Gare Du Nord); Art Hotel (3-star, €120 weekdays, €95 Fri/Sat/Sun); Avalon Hotel (2-star, doubles €110); Hotel Cambrai (5 min walk from Gare du Nord, 1-star, doubles €65). If you want a holiday to Switzerland by train not plane, but want someone else to organise all the train tickets & hotels for you, several specialist companies do just that, for a holiday with no airport hassles and no long days in cramped coach seats on motorways. Railbookers offer custom-made individual holidays with departure on any date you like, whereas Rail Discoveries & Great Rail Journeys offer escorted tours with specific departure dates. Railbookers can custom-make a flight-free holiday or short break to Switzerland for you, with train travel & hotels, for however long you like, leaving on any date you like. For example, they can do a 2-night short break to Geneva or a 4-night trip including the famous Glacier Express and the equally amazing Bernina Express. Rail Discoveries offers several train-based tours to Switzerland, with 3* hotels and travel from London by Eurostar and high-speed TGV. For example, they offer an 8-day tour combining Mont Blanc with the amazing Glacier Express (see the Glacier Express page). Check details & prices online at www.raildiscoveries.com, then book online or call 01904 730 727. GRJ offers five-star inclusive tours to Switzerland, with 1st class train travel and 5* hotels. Their most popular tour combines 1st class overland travel from London to Switzerland by Eurostar & high-speed TGV with a ride on the famous narrow-gauge Glacier Express, which runs right across Switzerland from St Moritz to Zermatt through spectacular scenery. Tours depart regularly throughout much of the year. Check the tour details & prices online, then call 01904 527120 to book or use their online booking form.